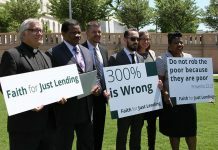 WASHINGTON, D.C. — Citing religious texts and evidence of widespread harm to households from high-cost payday loans, a diverse group of faith organizations announced today the formation of a new coalition to combat payday lending and predatory financial practices during a press conference on Capitol Hill. Members of the Faith for Just Lending coalition include the Center for Public Justice, Cooperative Baptist Fellowship, Ecumenical Poverty Initiative, Ethics & Religious Liberty Commission of the Southern Baptist Convention, National Association of Evangelicals, National Baptist Convention, USA, Inc., National Latino Evangelical Coalition and the PICO National Network. While representing distinct institutions with different histories and practices, these faith organizations hold a shared conviction that Scripture speaks to the problem of predatory lending — condemning usury and teaching us to respect the God-given dignity of each person and to love our neighbors rather than exploit their financial vulnerability. They believe that just lending is a matter of biblical morality and religious concern. Over the past several decades, high-cost lending to those in need has increased significantly. More than 20,000 payday and car-title loan stores operate nationwide. 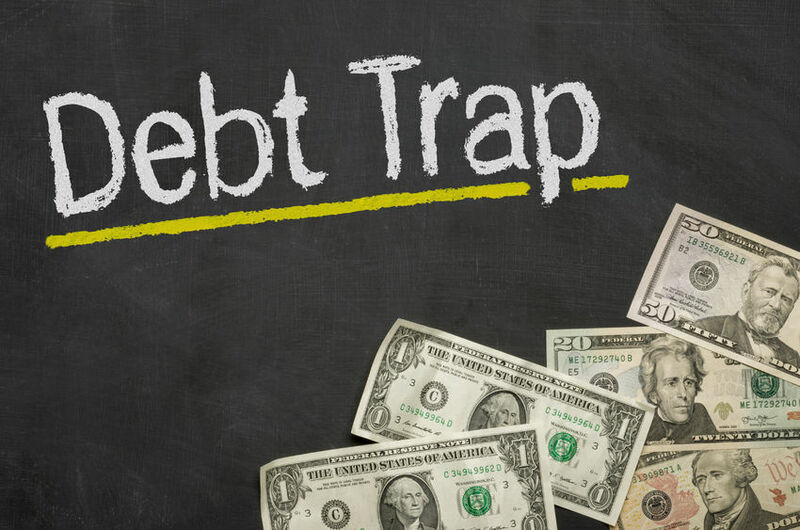 Taking advantage of loopholes and a weakening of traditional usury laws, many of these lenders now offer loans at 300 percent APR, resulting in families being trapped in a cycle of debt. 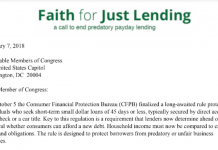 Faith for Just Lending believes the time has come to release the stranglehold that predatory payday lending has on too many lives in communities across the United States. With these principles for just lending, the coalition is urging churches, lenders, individuals and government to each do their part to teach stewardship, offer responsible products, use credit wisely, encourage just lending and put an end to predatory loans. The coalition is calling for an end to the exploitation of households and families through the payday debt trap. Dr. Russell Moore, President, Ethics & Religious Liberty Commission of the Southern Baptist Convention, Nashville, Tenn.
Galen Carey, Vice President for Government Relations, National Association of Evangelicals, Washington, D.C.
Rev. Dr. Willie Gable, Jr., Pastor, The Progressive Baptist Church, New Orleans, La., and Chairperson, Housing and Economic Commission, National Baptist Convention, USA, Inc.
Katie Thompson, Editor, Center for Public Justice, Washington, D.C.
Dr. Barrett Duke, Vice President for Public Policy, Ethics & Religious Liberty Commission, Southern Baptist Convention, Washington, D.C.
Stephen K. Reeves, Associate Coordinator of Partnerships and Advocacy, Cooperative Baptist Fellowship, Decatur, Ga.
Rev. Dr. Gabriel Salguero, President, National Latino Evangelical Coalition, New York, N.Y.
Rev. Sèkinah Hamlin, Director of the Ecumenical Poverty Initiative, Washington, D.C. Previous articleWhy Would Jesus Want to Release the Prisoners?